Moo Htay from Burma raised $1,104 to fund gynecological surgery. 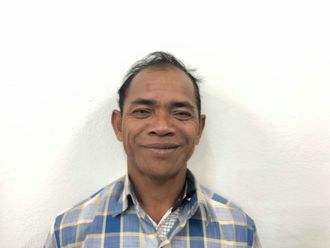 Moo Htay's treatment was fully funded on March 15, 2018. Moo Htay did not receive treatment as expected. This is because she has a son who requires constant care. Unfortunately, she was not able to find a caregiver for her son while she would have received surgery, and she asked for the surgery date to be moved. At that time, she will be re-eligible for Watsi funding. Moo Htay is a 55-year-old farmer from Burma. She lives with her seven children in Karen State, Burma. Since her husband passed away, the rest of the family works on the farm. They rent land from their neighbor, and sometimes Moo Htay’s children work as day laborers to earn some income. In her free time, she enjoys planting vegetable beside her house. Moo Htay has been diagnosed with a uterine prolapse. She has been advised to undergo a total abdominal hysterectomy, the surgical removal of her uterus and cervix. If left untreated, Moo Htay’s symptoms will continue to worsen and put her at risk for further health complications in the future. Fortunately, Moo Htay is scheduled to undergo her hysterectomy on March 15. Our medical partner, Burma Children Medical Fund, is requesting $1,500 to cover the total cost of her procedure and care. Once recovered, she will be able to walk and work normally again. Moo Htay's case was submitted by Than Than Oo at Burma Children Medical Fund in Burma. Moo Htay was submitted by Than Than Oo at Burma Children Medical Fund, our medical partner in Burma. Moo Htay's profile was published to start raising funds. Moo Htay was scheduled to receive treatment at Mae Sot General Hospital. Medical partners often provide care to patients accepted by Watsi before those patients are fully funded, operating under the guarantee that the cost of care will be paid for by donors. Moo Htay is no longer raising funds. Moo Htay's treatment did not happen. Read the update.